The best thing you can do to get better at rock climbing is to climb more. A lot of newbies often feel they need to build up more strength before they can start rock climbing in earnest, but this is a mistake. If you’re really serious about giving rock climbing a go, then don’t waste your time pumping iron at a regular gym to “build up your strength” before you hit the rocks. The best way to get better at rock climbing is to climb. It is really as simple as that. Pumping iron might be useful at a later stage but it won’t do you much good at the start. Plenty of buff guys coming into the rock climbing gym can’t climb to save their lives. If you wanted to get stronger, you should do it by climbing more, not swapping out your climbing sessions with regular weight training sessions. Why? Because weight training is symmetrical. When you do a lat pull down, you pull equally with both arms. You don’t use your legs to help you and you certainly don’t have to balance on tiny footholds while you’re at it. Additionally, time spent at the regular gym is time you aren’t spending climbing. Since you can only do so much weight training (your rock climbing sessions included) a week before you start to overstrain your muscles, you lose out on the opportunity to hone your other climbing skills – such as balance, finger strength, footwork, etc. Why are your legs so important in climbing? The more weight you transfer to your feet, the less mass you have to haul up with your arms – this is great especially if your upper body strength is poor. The most common reason why a newbie fails to make it to the next hold is because they can’t reach it or they are unable to get a good purchase on the hold because they are too low. Just moving your feet up a few centimeters can be the difference between making it to the next hold and falling off. The most common mistake a newbie makes is that they forget to move their feet up. The greatest virtue of down climbing lies in the fact that it makes you think about your feet and it teaches you to focus on your footwork. So the next time you’re climbing at the gym, try down-climbing a couple of routes. You should start with the routes that you normally “warm-up” on, that is, nothing too difficult. If you’re new to climbing, you’re probably wondering what the heck is traversing? It is basically a horizontal movement across the wall as opposed to a vertical climb up the wall. It is normally done as a climbing warm up before you start climbing in earnest at the gym. Just start at one corner of the gym and keep traversing horizontally until you drop off. When you first begin traversing, you may find yourself unable to stay on the wall for very long. Keep practicing until you can make your way around the gym easily or do laps across a short section. Try traversing with different holds and finding different rest positions instead of coming down when you need to take a break. If you are traversing as a “warm up”, then do so only until you feel your muscles warming up and stop well before the lactic acid builds up in your forearms (often called a “pump”). If you traverse until your arms are pumped, you won’t be able to do much climbing, especially if you’re new to the climbing scene. What does traversing do for you? It teaches you to use your feet and it helps you think of different ways to move on the wall. You can learn which moves are easier for you and you can work through a problem close to the ground which allows you to tackle the problem without wasting energy on the parts you can do easily. If you find it too easy and you want something harder, try skipping holds or use fingertips only – vary the exercise. As you get better at traversing, you can graduate to “bouldering” which I will talk more about below. your route-reading ability – how you look at a new route and figure out how to climb it. 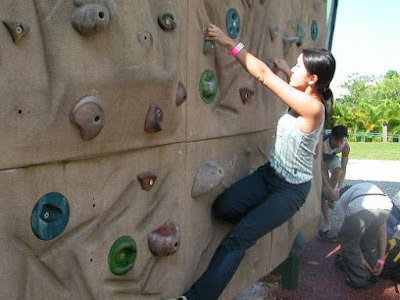 your repertoire of rock climbing moves – every new route will train your muscles in different ways. If you only climb the same routes over and over again, your body won’t learn anything new. Eric Horst once wrote about a climber who would climb at the same crag every weekend. He got so good that he could dance pirouettes around every single route at that crag. Until one day when someone broke one of the holds on a route and suddenly, he couldn’t climb that particular route any more. Don’t fall into this trap. Climb using only one hand (the easier routes, of course); or only one leg. Practice traversing on a slab (a forward inclining wall, see picture to the right) using feet only – this is great for improving your balance and your footwork. The wall in the picture below is a good example of a slab, but obviously if you’re only using feet, make sure it has bigger footholds. Climb using first touch – that means once you have placed your hand or foot, you can’t shift the position, even if it is awkward. This helps you think about how you use a hold so that you optimise your moves and reduce the number of unnecessary moves. Boulder – do this with a group of friends and give each other boulder problems to work on. 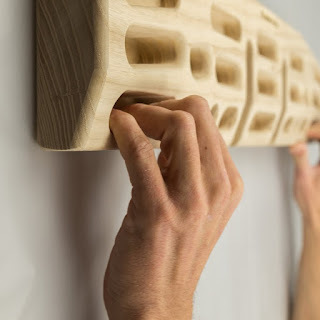 Bouldering is the act of climbing a section of a wall without a rope. A spotter (usually another climber) will “spot” you to make sure you don’t injure yourself if you fall while bouldering. There are also crash mats for you to land on. Bouldering tends to involve a shorter, more powerful sequence of moves and this is guaranteed to help improve your footwork and your strength. Do laps – up climb and down climb on a route that you can complete but is still somewhat challenging. Obviously, don’t pick one that you could climb in your sleep, make sure you feel like you are working out when you do laps. This helps to build your endurance. It’s climbing season again, which means it’s time to prepare and get stronger for upcoming challenges. FDP is shown in blue. Recently, I’ve treated a number of avid rock climbers coming into the clinic with a sore forearm. Upon further evaluation, they were experiencing what I would call “climber’s elbow.” There was pain on the lateral aspect of their forearms (lateral epicondyle) and weakness and pain throughout the extensor carpi radialis longus and radialis brevis muscle and tendons. Consequently, their finger tendons (flexor digitorum superficialis and profundus) were also being over worked and sore and needed to take time off climbing – That’s no good! Upon further evaluation, they all had restricted mobility in their neck and entire spine and a couple of them at one point in the past have had bad whiplash, or some degree of it where they couldn’t even move their necks for a few days. On assessment, the spinal segments of specific spinal vertebral joints were locked and some of the major muscles that attach from the neck to the shoulder were either in a hyper-toned state or were in spasm and had shortened considerably. Overall, the biomechanics and the range of motion in the neck and shoulder were not even close to optimal and the whole upper quadrant, arm strength and mobility were deficient. The approach to these types of injuries involves treating the body as a whole in how the fingers / hands work together with the shoulder, neck and the rest of the spine. A stiff and weak neck will ultimately cause posture compensations when climbing; which will then lead to an abnormal increase in use of power through the shoulders and also the forearms and fingers. Any slight tweaks in the shoulder like temporary rotator cuff impingement can lead to increased scar tissue in the shoulder capsule and then altered mechanics in movement. With altered mechanics in the shoulder, the forearm then will need to be utilized more and more power is applied through the finger tendons which lead to various issues of tendinopathies, tenosynovitis, ligament sprains and annular pulley strains / tears (annular pulley tears can sideline you from climbing from several weeks to quite possibly several months to a year depending on the severity of the tear). 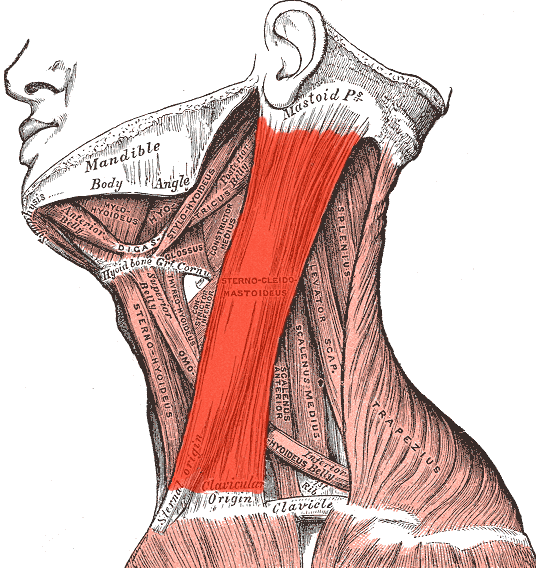 With Manual therapy, we can ‘unlock’ the spinal segments of the neck facet joints utilizing gentle mobilization techniques to restore its mobility. Gentle stretching and mobility exercises can then be use to safely increase the flexibility of the muscles and soft tissue and to reinforce the gains in joint mobility. 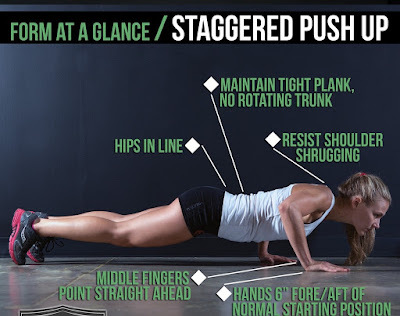 Specific core strengthening exercises can then be used to progress static and dynamic strength. Scar tissue also usually builds up in either the front or back capsule of the shoulder from the impingement syndrome. Using gentle joint mobilization and soft tissue techniques, we can free up the shoulder to restore a more optimal range of motion. The forearm muscles also need to be released because the tightness actually puts a prolonged strain on the finger tendons thus not allowing them to fully recover from your repeated bouts of climbing. This is especially important for people that also sit in front of the computer typing for most of the day. In addition to restoring mobility, it is also extremely important to work on achieving muscle balance in the “whole upper quadrant” from the hand all the way up to the neck. If the injury in the hand or forearm is acute, cold baths 2’/2’ (2 minutes on / 2 minutes out) for 3-4 times twice per day is good to take the swelling down. If the injury is no longer acute (not hot and swollen) but still has residual swelling or continued joint tightness, then hot / cold contrast baths are ideal 2’/2’ (2 minutes hot / 2’ minutes cold) for 3-4 times twice per day. This is to help increase the blood flow and flush out the residual swelling that is there. As you get back into climbing, you need to be at least 75-80% strong in that whole upper quadrant and it’s recommended that you tape the fingers to give it support whether it’s a ligament or tendon injury or pulley strain, even if you no longer have any pain. It takes tendons and ligaments up to 4-6 weeks to fully strengthen and if you begin climbing too hard too soon, your muscles will get strong but your tendons, ligaments and pulleys will lag behind. Do you want to stay healthy in order to send climbing projects or to just enjoy the rest of the climbing season injury free? Then the single one most important thing to staying injury free at this point 4-6 weeks post rehabilitation and climbing again is focusing on recovery. Recovery means keeping muscles loose and stretched out immediately after climbing, sports and activities and strengthening opposing muscles to the sport (climbing – strengthening pectoralis major, triceps, deep neck flexor muscles and inner core stability strength). Also try implementing some cardio training (running and cycling); As this will increase your recovery overall, not to mention your body’s over endurance on longer climbs. Avoid over training (not taking enough rest days in between climbing sessions or doing too many heavy climbing sessions consecutively). Wil has earned degrees in Bachelor of Kinesiology and Bachelor of Health Sciences Physiotherapy (B.H.Sc. PT) from McMaster University. He is a member of the Canadian Physiotherapy Association (MCPA) and a Fellow of the Canadian Academy of Manipulative Therapists (FCAMT). In addition, he completed post-graduate studies in Advanced Manual and Manipulative Physiotherapy (Dip. Manip. PT) and Sport Physiotherapy (Dip. Sport PT), and is certified in Intramuscular Stimulation (CG IMS). Wil has been working for over 13 years as a Physiotherapist in the Lower Mainland. He brings a great sense of joy and passion in helping people recover from their injuries and getting them back in sync with their optimal health and maximum potential for sport, work or play. 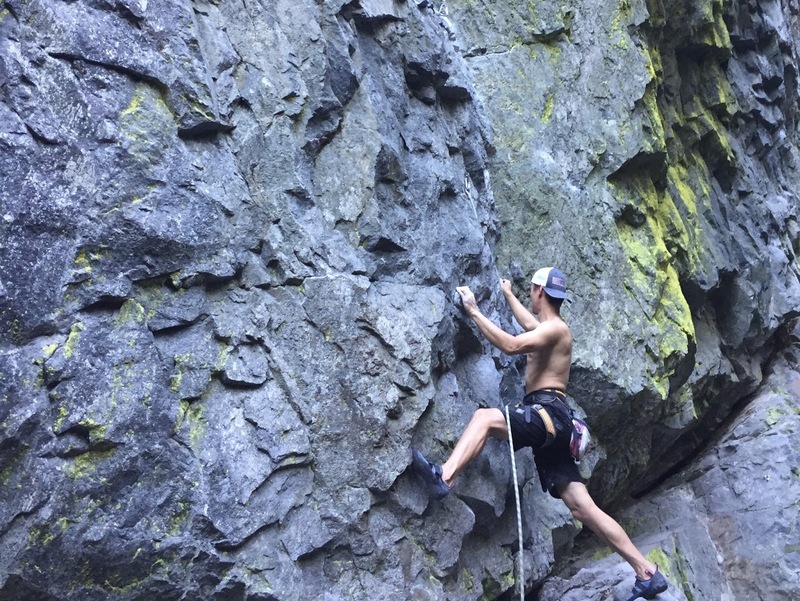 Wil has also been an avid rock climber for over 13 years and has a thorough understanding of what it takes to help you connect with how you really want to move again this climbing season!